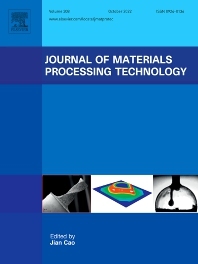 The Journal of Materials Processing Technology covers the processing techniques used in manufacturing components from metals and other materials. The journal aims to publish full research papers of original, significant and rigorous work and so to contribute to increased production efficiency and improved component performance. The core interest of the journal is the processing of metals, but we also cover other materials, where the article is focused on the influence of the process on the materials, and where there are not other more appropriate dedicated journals. For example ductile forming of polymers if of interest, but the influence of polymer composition on properties is well covered in dedicated polymer journals. A typical article will examine the influence of process design, tool design, or process operating conditions on the properties of the material or the future performance of the equipment. Most articles combine appropriate quantitative analysis with well designed experiments. The sciences of materials, tribology and thermodynamics are well covered in other dedicated journals, so these topics are of interest to this journal only when applied specifically to give insight into the processing techniques used in manufacturing components. For example, processes for engineering surfaces are of interest, but the analysis of friction is well covered by specialised journals of wear or tribology. The journal's Editorial Policy defines our basis for considering submissions. Typical published articles will contribute significant new transferable knowledge in the form of (a) an innovation or (b) a new insight into material processing in the form of a transferable qualitative or quantitative explanation of a difference between experimental measurements and the predictions of existing theory. 'Transferable' knowledge applies to materials or processing conditions broader than those tested within the article. • Topics that properly belong to the materials science literature. Examples include the synthesis of materials, chemical experiments and studies of material composition. • The analysis of material properties, surfaces or product performance without reference to the processing which caused them. • Statistical methods or techniques from Artificial Intelligence which treat the process as a black box. • The operation of equipment, without reference to materials (such as tool path design in CNC machining), or the management of factory systems. As stated in the journal's editorial policy, the Journal of Materials Processing Technology does not accept multiple-part papers, short communications or case studies. Papers submitted to the journal will only be considered if they have been prepared according to the journal's Guide for Authors.